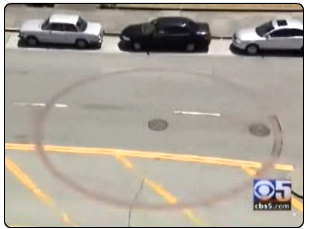 I have often wondered what the brick circles along many of the streets in San Francisco are. I had always thought they were some kind of historical marker. It turns out they represent a nice piece of long term civic planning and disaster preparedness. Each one marks a 75,000 gallon cistern that is an emergency water supply for earthquakes and fires. These were installed during the rebuilding effort after the 01906 earthquake. I have not found too much documentation on it except for this little snippet from Channel 5 news. It is a reminder that many civic water projects represent some of the most forward thinking in western society… at least from an engineering point of view. From a societal point of view however, some of this long term planning to feed cities with water, has had disastrous effects on the upstream and downstream users of the water. Owens Valley to LA, The Colorado River to the south west, and now the Great Basin to Las Vegas are all incredibly forward looking in their engineering, but terribly short sighted in the long arc of societal resource allocation. Are we ready to reach out to the stars?